While enjoying a family high school graduation party, I photographed the view from the front of my cousin’s house. Not bad, eh? 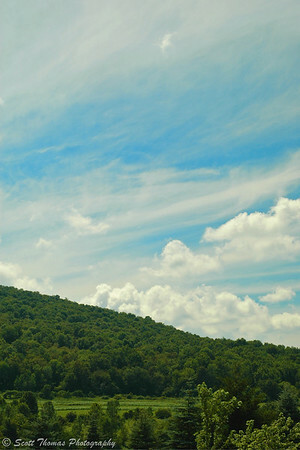 A summer landscape near Fabius, New York. Nikon D70/50mm, 1/320, f/9, ISO 200, EV +0.3, Polarizer filter. Besides the big cats, bighorns and birds during the Sunset Safari at the Rosamond Gifford Zoo, I watched some bees going about their business of collecting pollen and nectar on some purple coneflowers. A bee visiting a purple coneflower at the Rosamond Gifford Zoo in Syracuse, New York. Nikon D70/70-200VR, 1/160s, f/3.2, ISO 200, EV +0.6, 200mm focal length. On a balmy Summer’s evening I took in a minor league baseball game in the picturesque Alliance Bank Stadium in Syracuse, New York. 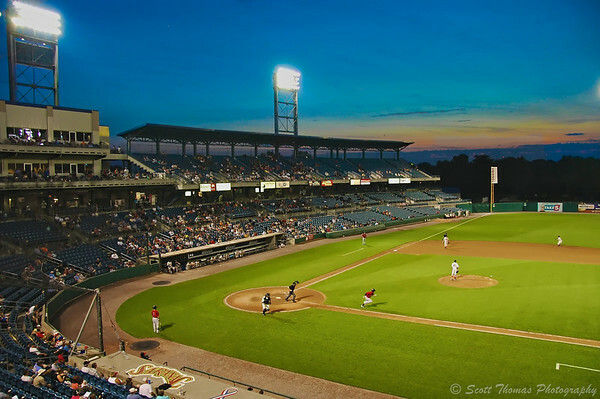 Pawtucket Red Sox take on the Syracuse Chiefs in International League Baseball action at Alliance Bank Stadium in Syracuse, New York. Nikon D70/18-200VR, 1/80s, f/4.5, ISO 800, EV +0.3, 18mm focal length. Post processed in Apple Aperture 3 and Noise Ninja. 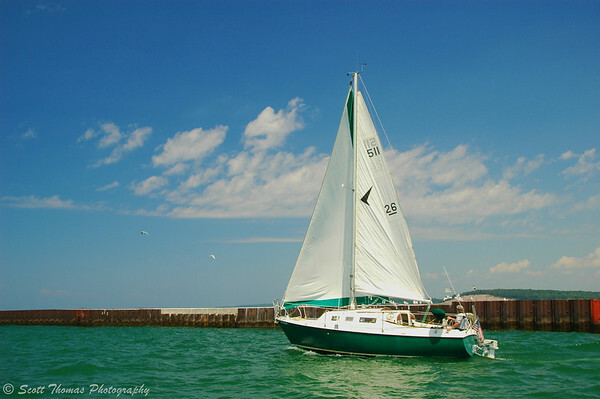 I went on a boat ride on Lake Ontario and photographed a sailboat leaving Fair Haven Beach State Park on a breezy summer day. Sailboat heading to Lake Ontario from the Fair Haven Beach New York State Park. Nikon D70/18-200VR, 1/250s, f/8, ISO 200, EV +0.6, 24mm focal length. 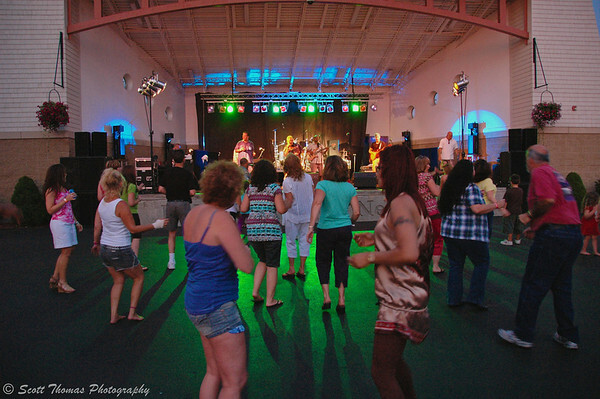 The evening I photographed the sunset lighted Cloudscapes, I was attending a concert by the popular local band, Atlas, who got the crowd up and dancing on a hot and humid night. If you are a photo buyer looking for photos of upstate and central New York, click here to see my IthacaStock.com catalog. Thanks! This entry was posted in Nature, People, Sports and tagged baldwinsville, bee, concert, coneflower, fabius, flowers, insect, Lake Ontario, landscape, new york, purple, rosamond gifford, sailboat, summer, water, zoo. Bookmark the permalink. It was a lovely day on the lake. A bit wavy but fun to fly over them. The sailboats were enjoying the day. Looks like July was a thoroughly enjoyed month! I leave for my Maine vacation in a little more than a week – looking forward to putting the camera through its paces! Oh, my, yes, the Chiefs got crushed that night. This is the second year with the Nationals. Previously, they had been the Toronto farm team and before the Yankees (which makes more sense but the Yankees decided to part ways back in the 70’s and hook up with Columbus). You sister certainly enjoyed Maine. Have a lobster roll for me! Nice summer you’re having, Scott! Fabius is a very appealing place. Fabius is very rural. When the wind shifted just right as I was photographing the baseball tournament, we’d get a whiff of the local Dairy farms. 🙂 Beautiful area. I´m looking foreward to see all the photo essays, – and to make one myself. This is a nice little view of your summer until now, it looks like you have had a very nice month. The colors are nice too, especially at the zoo photo. Thank you, Birgitte. Looking forward to your photo essay, too! Scott, thanks for the Exif data, reading it makes a lot more sense now. It’s been very helpful and I’ve to keep in mind that you ISO lowest number is 200. I absolutely love the Alliance Bank Stadium, the evening sky is stunning. The sailboat is another one of my favorites also. Yep, Nikon’s base ISO is 200. I’ll try to continue adding the Exif data. Nature has provided some wonderful skies over the last month. Looks like July was a good month for you and you captured some of it beautifully. I enjoy the variety. Thanks, Consuelo! Will be easing it a bit for a couple of weeks with some great stuff coming this fall. I love the title – Gratitude. Yes, we all have things to be grateful for. You’ve had quite the month! 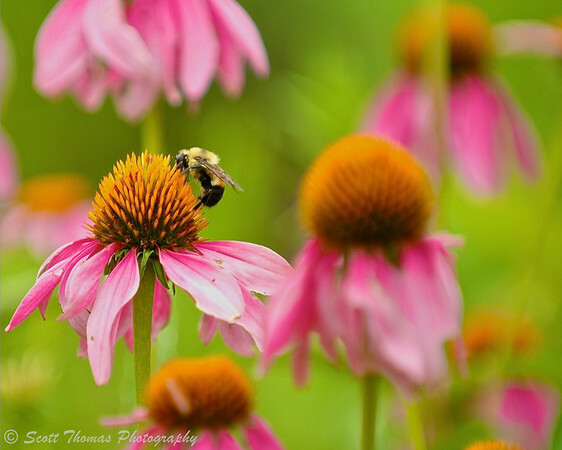 I really love the bee.purple coneflowers shot. The perspective is fantastic. Peering into the bee’s world as they simply do what they do. Yes…after reading Kathy’s article and looking at the photos I had chosen for this one, gratitude fit nicely. Just imagine if I had used a real macro lens for the bee photo. The 70-200VR is not quite the right lens for the job but it wasn’t bad either. Wow, your cousin has quite the view! LOVE the flower/bee shot. I’d say that 70-200 captured it really well! A macro shot of it would have been different, but not necessarily better.